So You Think You’re a Philadelphia Flyers Fan? tests and expands your knowledge of Flyers hockey. Rather than merely posing questions and providing answers, it will give you the details behind each—stories that bring to life players and coaches, games and seasons. • What goalie recorded the first shutout in team history? • Which former Flyers coach later won a Stanley Cup for another team? • Who scored the very first regular-season overtime goal for the Flyers? • What opponent went forty-two games without beating the Flyers at the Spectrum? This book makes the perfect gift for any fan of the Fly Guys! Skip Clayton hosts Racing Wrap, a weekly one-hour radio show on WBCB Levittown, Pennsylvania, and has covered sports for the ABC Radio Network for over forty years. Clayton is also the author of Philadelphia’s Big Five and coauthor of Tales from the Miami Dolphins Sideline and 50 Phabulous Phillies. He resides in Sellersville, Pennsylvania, with his wife, Joanne. 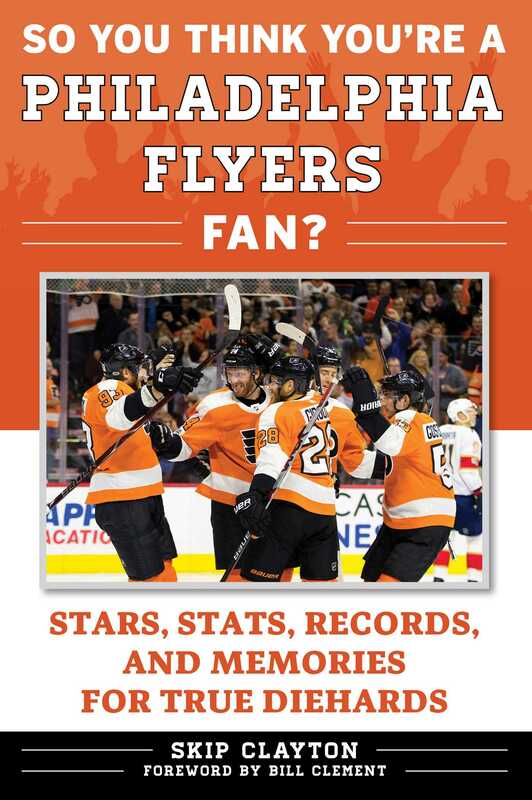 Book Cover Image (jpg): So You Think You're a Philadelphia Flyers Fan?